Introduction: I think its really scary to all of a sudden forget ten years of your life - to wake up and realize that your dreams of a perfect happy little family, a promise of friendship - all those things you protect so much to keep are all gone now. To wake up and suddenly realize you dont know the person you've become. I guess this book has given me a new perspective in life - to really hold on to what matters most in life today before they become just another memory that you might forget one day. Overview: Alice is twenty-nine. She is whimsical, optimistic and adores sleep, chocolate, her ramshackle new house and her wonderful husband Nick. What's more, she's looking forward to the birth of the 'Sultana' - her first baby. My Opinion: Part of me enjoyed this book, because the story line is something that catches my attention. 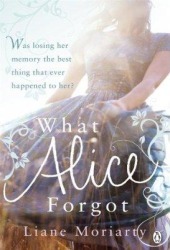 I guess because I was able to relate to what Alice felt... to suddenly not know details of my life. Its not the Alice and I have the same situation, but just like Alice... I'm in that point where she was 10 years ago - I'm also full of hope, looking forward to my future with the man I love, together with our kids. Its scary for me to wake up one day and realize I lost everything I want to have so much before. Although honestly, there are parts of the book that I wish the author has established more... I feel like Nick is lost as a character. I cant feel his presence and importance in the story. Although Elizabeth's character is amplified by her journal, I cant seem to connect the sister/ bestfriend bond that she and Alice used to have. So although Alice is missing ten years of her life, I dont. sounds like an alright novel. Following.